To download and print the delivery and collection instructions, please click here. This address can be used for general courier deliveries but for pallet and other bulk deliveries see below. Delivery access to Central Hall is at the back of Manchester Central via the ramp off Albion Street. If using a satellite navigation system, please follow the postcode M1 5LN which directs to Albion Wharf, 19 Albion Street which is directly opposite the entrance to the ramp. For those familiar with Manchester landmarks, the Hacienda nightclub (and the eponymous apartment block which replaced it) was/is on the corner of Whitworth Street and Albion Street, with the City Road Inn on the opposite corner of the junction. The Manchester Central access ramp runs parallel to Whitworth Street West behind the Deansgate Locks strip of bars with the access to the ramp located behind the Apex tower construction site at the eastern end of Deansgate Locks. Note: The new Apex Tower construction does make the entrance a bit difficult to locate, so please ensure that your delivery drivers are fully informed of the delivery route BEFORE attempting to access the site. 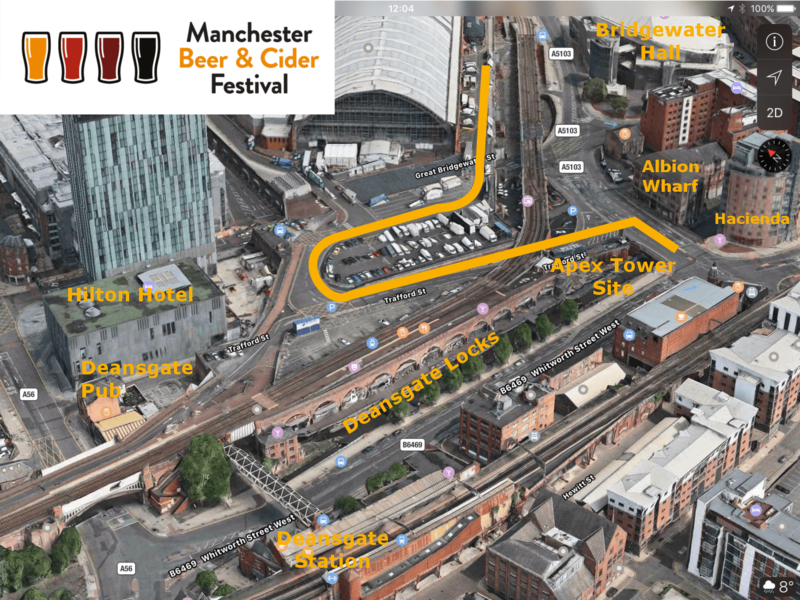 Manchester Central is a very busy venue with events taking place in the Central Hall either side of Manchester Beer & Cider Festival and in other parts of the complex during the festival. CAMRA has access to the hall from Sunday 20th to Sunday 27th January 2019. No deliveries / collections can be made outside of these days. The main delivery days are Sunday 20th & Monday 21st January between 10am and 4:30pm, unless advised otherwise by us. For deliveries on any other day, prior arrangements must be made with the MBCF Logistics team. All equipment including empty casks & kegs must be removed from the hall by 4pm on Sunday 27th January. Any heavy items (e.g. bars, cooling equipment) must be collected on Sunday before 4pm as there may be another event loading in on Monday 28th. It is imperative that as many empty casks and kegs as possible are removed from site on Sunday. Monday collections will be from the marquee behind the main hall. We would encourage breweries to arrange uplift of their casks and kegs on Sunday (before 4pm) either by the brewery themselves or by arrangement with other brewers. If essential we have a limited ability to allow collection or the remaining casks on Monday between 10am & 2pm. Any casks not collected by 2pm on Monday may be referred to Keg Watch for collection at the supplier’s cost. Please confirm collection arrangements for your casks & kegs with the Logistics Manager in advance or notify us of this at the time you confirm our order with you. MBCF has made an arrangement with OneCircle for all KeyKegs and other plastic one way containers to be collected direct from the festival for recycling. If you are supplying in E-Cask/E-Keg or Kegstar containers please advise your MBCF orderer in advance so that arrangements can be made with appropriate agents for collection. If using a satellite navigation system, please follow the postcode M1 5LN which directs to Albion Wharf, 19 Albion Street which is directly opposite the entrance to the ramp. See map above. Stop at the barrier at the top of the ramp. You will be issued an access pass by the Manchester Central Security guard. On entering the site you will be directed to entrance VE.B where MBCF personnel will be waiting to meet you and directed to the appropriate point for off-loading. You must advise the person on duty which breweries you are delivering on behalf of. When driving in the hall, be aware of pedestrians inside the hall. A 5mph speed limit is in place. Vehicle hazard lights must be used. Vehicle access to the hall is for delivery and collections only. Vehicles must exit the hall immediately after delivery. MBCF Traffic Marshals will direct you to your drop off point where the logistics team will check off your delivery. When outside of your vehicle, hi-visibility clothing must be worn. All drivers must follow instructions from marshals at all times. After making your delivery, proceed to the exit. Note there is no parking permitted on site. All vehicles must leave site immediately after delivery.